Pre-owned Audemars Piguet Royal Oak Offshore Chronograph 18ct Rose Gold 26400RO.OO.A002CA.01(AP serviced 2018) in exceptional condition. 44mm 18ct Rose gold case. Black (Mega Tapisserie pattern) dial with luminous gold hands and index hour markers. Tachymeter around the outer rim. Luminescent hands and markers. Date display at the 3 o'clock position. Chronograph - three sub-dials displaying: continuous second, 30 minute and 12 hour. Fixed black ceramic bezel. Automatic movement with 55 hour power reserve. Scratch resistant sapphire crystal. Screw down black ceramic crown. Skeleton case back. Functions: chronograph, date, hour, minute, second. Black rubber strap with 18ct Rose Gold pin buckle. Water resistant at 30 meters / 100 feet. 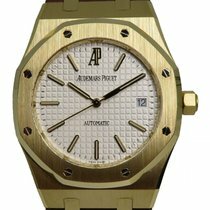 Box & Audemars Piguet Warranty Papers dated November 2012. This watch has been back to Audemars Piguet service centre where it underwent a full service to its movement as well as a full refurbishment to both case and bracelet. The watch is complete with its service invoice(£1,300) and 2 year service warranty dated September 2018. The pictures you see are pictures of the actual watch!!. We only sell watches which we have in STOCK! All watches presented can be viewed and collected at our office in Wilmslow, Cheshire at your convenience or sent by insured courier. Please note that office visits are by appointment only and because our watches are securely stored away from our offices in a bank vault, we usually require 24hours notice for a viewing. If you are not delighted with your purchase then we are happy to refund your full purchase price within 14 days of receipt, just return the watch to us as you received it and we will refund by the same payment method.